I think it's pretty perfect too. I actually think I need a TSN intervention now. Haha. I should really move it away from my bed. 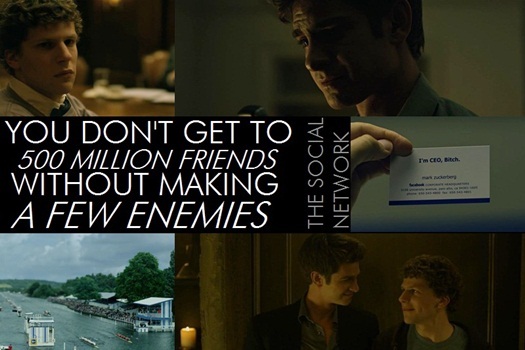 Like as soon as I get a free two hours, I'm like THE SOCIAL NETWORK time! The special features are amazing too. A TSN intervention would be good right about now for me too. TSN is like one of the best I have seen, other than Inception. I mean seriously. I could just watch both of those movies again and again and again. But I don't have TSN's DVD :'(..can't wait for my birthday. Just a question, where do you get your screencaps from to make this 5 Favourite Screencaps? Thankful someone else agrees! Whenever you get it, make sure you get the 2 disc edition. Hopefully your birthday isn't far away! I watch it even without having any free time...I'm supposed to be studying for a really important exam, but instead I decide to watch the Trent Reznor-Atticus Ross feature about Hand Covers Bruise. How can they...how is it sooo bloody perfect?? Ha! That last image should TOTALLY be your blog header. I would crack up every time I came for sure! Tom - That is a great shot. I really like the way that whole scene is set up. David Fincher is brilliant! Fletch - Haha, I might do that one day. It was my screensaver for a while...every time I opened my laptop I cracked up!